SkyBridge helps organizations streamline data and systems through Oracle E-Business Suite. 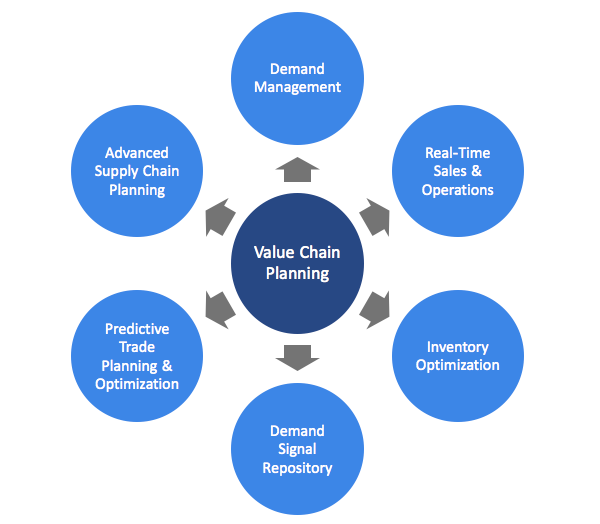 With EBS for Value Chain Planning (VCP), advanced supply chain planning allows supply chains to be transformed into information-driven value chains. Today’s mergers, operational expansion, globalization, sales channel expansion, and overall organic growth push the limits of operational capacity. Many see the opportunity for efficiency and the potential for a competitive advantage that will last for years. Oracle’s Value Chain Planning suite is a comprehensive set of applications that possess open and flexible architectures, best-in-class capabilities and complete functional coverage. The suite offers both integrated and modular deployment options. SkyBridge team of highly experienced consultants provide thought leadership, project management, functional and technical consulting for Oracle’s Value Chain Planning suite. The E-Business Suite consultants and developers at SkyBridge are proven experts. What was fragmented planning process, on an outdated system is transformed into an environment where continuous monitoring and speed provide the decision-making confidence your organization requires. EBS for Value Chain Planning offers best in class solutions. The consultants and developers at SkyBridge can help you maximize capability opportunity, incorporating pre-integrated applications, and supplementing with application development and system integrations. For 20 years’ SkyBridge has helped clients gain advantages through ERP. Our EBS for Value Chain Planning clients come to us for implementations and to upgrade system capabilities. E-Business Suite clients often utilize VCP functionality including: Advanced Planning and Scheduling (aka Advanced Supply Chain Planning), Manufacturing Planning, and Demantra utilization.